In case you missed it yesterday, be sure to read our look at ties between that South Florida massage parlor baron and the Chinese government. Video of this exchange after the jump. Really quite remarkable. We’ve now seen the first portion of the President’s comments. 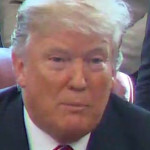 He gave a generic condemnation of the massacre in Christchurch, New Zealand and then proceeded to give a meandering speech about foreign “invasion”, i.e., immigrants “rushing our border”, calling them “murderers and killers”. In other words, moments after denouncing the massacre he went on with a lie-laden screed much of which was indistinguishable from the attacker’s manifesto. A chilling example of what I explained in the post below. Fox analyst and former Trump middle east advisor Whalid Phares calls what the gunman in New Zealand did “very understandable … on a political level, obviously it’s horrific and it should be condemned completely on the action level.” In other words, reasonable goals but he went about it the wrong way. Watch.